March 19, 2018, Sarnath, UP, India – It was still dark in Delhi this morning when His Holiness the Dalai Lama left for the airport to board a flight to Varanasi. By the time of take-off, however, the sun had risen. Vice-Chancellor of the Central Institute for Higher Tibetan Studies (CIHTS), Geshe Ngawang Samten received him on arrival at Lal Bahadur Shastri International Airport, from where he drove to the Institute in Sarnath. Smiling students holding white scarves, flowers and sticks of incense lined the way from the gate to His Holiness’s residence. Tashi Shölpa dancers sang and danced to welcome him. As he stepped out of his car a couple presented a new-born baby for him to bless. Young men and women in Tibetan costume offered the traditional ‘chemar changpu’. Just before ten o’clock, Association of Indian Universities (AIU) President Prof PB Sharma and Secretary General Furqan Qamar, with Geshe Ngawang Samten, escorted His Holiness to the Conference Hall nearby. Once everybody was seated the institute song was performed by a mixed group of students. This was followed by a rendering of the auspicious Mangalacharan in Sanskrit by a group of female students, including some nuns. Their recitation was followed by a group of monks chanting the same piece in Tibetan, with which His Holiness joined in. In his welcome address, Geshe Ngawang Samten, on behalf of every member of the CIHTS University, expressed deep gratitude to His Holiness for accepting their invitation. He welcomed everyone who had come to attend the meeting and pointed out that this is the first time that an AIU gathering has taken place in Varanasi, reputedly the oldest city in India. He also reminded everyone that Sarnath is where the Buddha gave his first teaching after his enlightenment and voiced the hope that transformative insights will emerge from the discussions that will take place over the next three days. Prof Furqan Qamar, Secretary General of AIU, in his introductory remarks, thanked CIHTS and its Vice-Chancellor for hosting the meeting and declared it was a privilege for everyone attending to be in His Holiness’s presence. He noted that this year’s theme, ‘Higher Education in an Era of Innovation, Entrepreneurship and Disruptive Technology, with a Focus on Human Values in an Era of Disruption’might weigh heavily on participants, but suggested there could not be a better setting, nor a better person to guide the conversation. In his remarks, Prof Francisco Marmolejo, the World Bank’s Lead Tertiary Education Specialist, noted that this is a unique moment for India, when it is going to find itself with the largest most youthful population in the world. He said it is in India’s and the world’s interest for India to succeed, because if she does not the world will fail. In this higher education is essential, as is human dignity. Not only is there a need for more education, but also for better education. His Holiness was called upon to release the AIU Annual Report, as well as a collection of occasional papers. Then, as the Chief Guest, he was requested to give the inaugural address. Although yesterday, due to weariness he had sought permission to speak from his chair, today he stood at the podium. “Respected brothers and sisters, this is how I prefer to begin because I really feel that if we kept the 7 billion human beings alive today in our hearts as brothers and sisters, many of the problems we face would disappear. Instead we think in terms of ‘us’ and ‘them’, which just leads to trouble. The world is becoming smaller and more interdependent. The global economy has no boundaries. Climate change affects the entire world. Our lives depend on water, and yet it is becoming increasingly scarce. In this new reality we must find new ways to think and act. Violence and war, outdated behaviour, must cease. “When men fought in the past with swords, spears or obsolete guns it wasn’t so serious, they couldn’t do too much damage, but today there are several thousand nuclear weapons primed for use. “I have visited both Hiroshima and Nagasaki, the two places where nuclear weapons were used against human beings and I will never forget seeing a watch, its hands stopped at the instant of the attack, half melted by the intensity of the heat. “Several years ago at a meeting of Nobel Peace Laureates in Rome we heard about the practical consequence of a nuclear exchange, which were far-reaching and utterly horrifying in the damage it would do the world and its people. I suggested then a resolution to reduce and eliminate the stock piles of such weapons, setting a clear time-table for its accomplishment. But nothing happened. “We should reflect on the contradiction that if one man kills another he goes to jail, but when a man is responsible for the deaths of hundreds in war he is feted as a hero. Violence results from anger and fear. These are what we must reduce. “As a young monk in Tibet I studied reluctantly until I began to recognise how valuable was the knowledge Shantarakshita had brought to our country in the 8th century. What was precious about the Nalanda Tradition we have since kept alive was the wonderful opportunity it provided to build inner strength and achieve peace of mind, which doesn’t depend on external factors. “As I’ve already mentioned, the 20th century saw great developments in many areas, but it was also flawed by violence. Today, elements of the old way of thinking that gave rise to it remain—the inclination to solve problems by use of force. This is simply out of date. If it had resulted in general benefit it might have been acceptable, but it has never been the case. This is why this century should be an era of dialogue, a time when we think of others as part of ‘us’ and seek equitable solutions to conflicts between us. “Education has a role in this. Ancient Indian knowledge of the workings of our mind and emotions has a practical contribution to make. Just as we teach children to follow codes of physical hygiene to protect their health, so we need to institute a corresponding sense of emotional hygiene. His Holiness explained that in ancient India the common practices of shamatha and vipashyana, tranquillity and insight, gave rise to a profound understanding of the mind. And although this is recorded in religious texts, there is no reason at all why today it cannot be studied from an academic angle. This appreciation of mind and emotions involves a thorough-going use of logic and reason—a scientific approach. 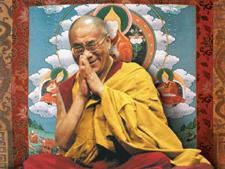 His Holiness cited the relevance today of India’s age-old traditions of ahimsa and secularism. India is the one country where all the world’s major religions live together side by side. “That the Buddha was a product of ancient India is something we can all be proud of,” he continued. “Today, we should combine modern education with the ancient Indian understanding of the workings of the mind and emotions. We need to rely on common sense and scientific findings. For more than 30 years I have engaged in discussions with scientists that have been mutually beneficial. Raja Ramana told me that although the findings of quantum physics seem new today, he had found what he recognised as corresponding insights in the writings of Nagarjuna from many centuries ago. “Similarly, when we compare ancient Indian and modern psychology, the modern tradition still seems to be at a very preliminary stage of development. Peace of mind is not only the proper basis of world peace, it also enables us to make full use of our own intelligence. CIHTS Registrar Dr RK Upadhyay offered words of thanks. Everyone stood for the National Anthem. Next, Vice-Chancellors gathered at the foot of the stage on the Kalachakra Ground where a group photograph was taken with His Holiness, after which they enjoyed a sumptuous lunch together on the Library Lawn. His Holiness will attend a further session of the meeting tomorrow morning.